Jo Malone London's Blue Skies & Blossom Collection fired its arrow straight into my heart right after my visit to Japan during this Spring. We were a week or two too late, thus we were trying to catch a view of the sakura high bloom by taking advantage of our Japan Rail Pass. During a sunny day in Kyoto, we visited Ninna-ji. This particular temple has a big garden of a different type of cherry trees which are known by their late blossoms. Only after I stepped into the garden, I could fully appreciate the unique experience it offers. Hundreds of meters long and wide, tightly planted cherry trees were in full blossom, meadow was covered in petals. No other colors to disturb the scene but white pink and green. If you raise your head, you could see the tower of an ancient temple raising over the cloud of sakura trees (I tried capture it in this photo). And the lingering aroma... I have never smelled anything like this before. So distinct, yet so pleasant and never overwhelming. Taking deep breaths, we walked in this surreal maze. 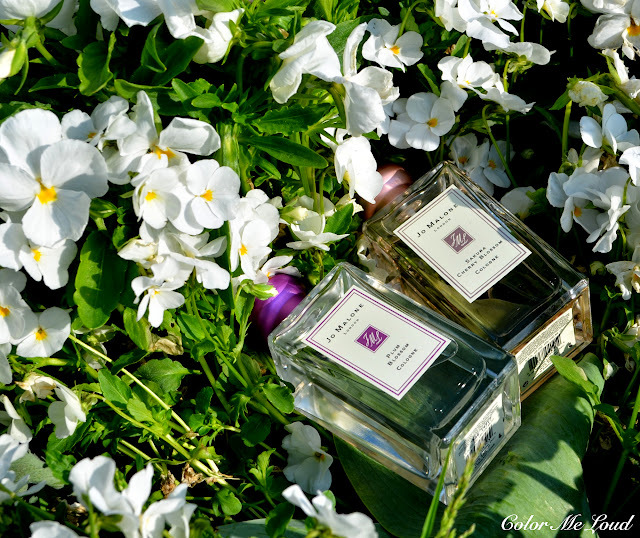 Later that month, I came across Jo Malone Blue Skies & Blossom Collection during my travel to the States. It is composed of three repromoted fragrances of the line, Sakura Blossom, Plum Blossom and Osmanthus Blossom. I have sampled all three and fell in love with Sakura and Plum Blossom as they put this unforgettable experience in a bottle for me. To make this review a little more special, I have taken the flacons to the park close to our flat and took some pictures with lovely flowers. I hope you will enjoy them as I share my thoughts about Sakura & Plum Blossom with you. Plum trees start blossoming earlier than cherries. Therefore I would like to start my review with Plum Blossom Cologne. I have to admit the color of the lid was the first thing which caught my attention and made me search for the fragrance, since the Jo Malone Counter in Nordstrom didn't have a tester. After the first whiff though and a second one about half an hour later, it was clearly pure love. Plum Blossom is the fruity/floral offering of the three. It is nothing but generic. Me and fruity fragrances, we don't get along so well. I am usually overwhelmed with the sweet syrupy, or even worse, tropical sun creamy fragrance offerings of main stream perfume houses. I have been trying out different fruits to be able to find a summer fragrance, with a touch of fruit and the right amount of woods and musk to balance it. I looked into various fig fragrances since these tend to be on the woodier side but would like a fresher touch. I am glad to say that, Plum Blossom does it for me. It is very light but still significant, with a fruity opening, which turns a little more floral shortly after being applied. As the time passes its musky and woody base reveals itself on top of its beautiful fruity/floral theme. It is not sweet, very well blended and clean. Perfect for a summer day or evening alike when you wear flowy and airy dresses made of light fabric. Plum Blossom stays long on me considering it is a cologne, it is in fact the one with the longest staying power in this collection. Although Plum Blossom stays close to skin, even after 5-6 hours it is recognizable. It is like a fresh breeze to my collection. Similar to Sakura being the star of the trees that blossom with its multiple flowers on each branch, to me Sakura Cherry Blossom Cologne is the star of Blue Skies & Blossom Collection. It reminds me of one short hour we were lucky to spend between cherry blossom trees in Ninna-ji in a bottle. Sakura starts fresh and a little citrusy after it is sprayed. Citrus is short-lived, quickly cherry blossom heart starts beating. There is a touch of rose which makes it even more romantic and fairy tale like as well as a little powdery. Musk and woody notes starts appearing soon, forming the right base for the blossom. 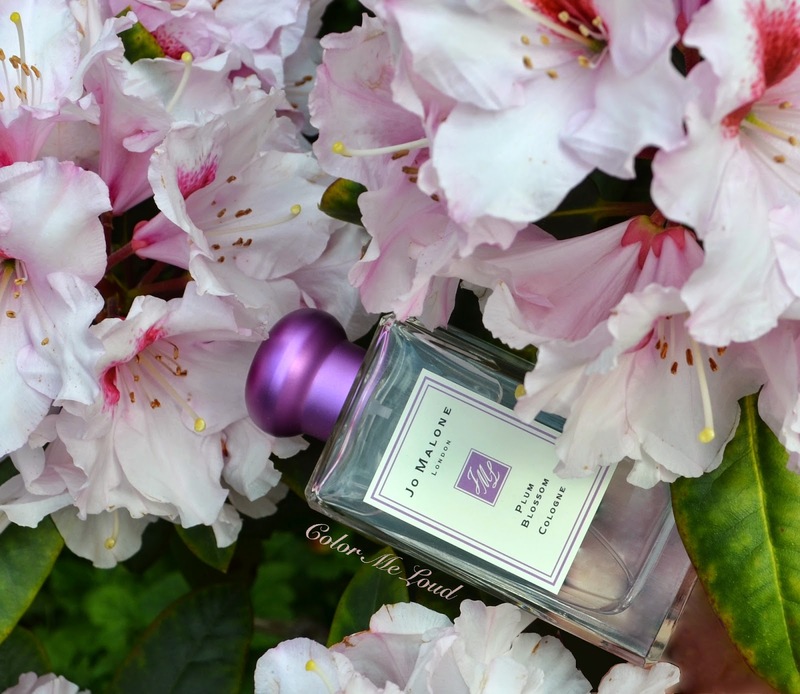 Sakura Cologne is light, a little floral, woody, clean and very pleasant. Sakura lasts a little shorter than Plum Blossom on me, around 4-5 hours similar to the short lived cherry flowers. It is hard to find a woody yet light summer fragrance without being generic. Sakura is for those who would like to touch of florals, enough wood and uniqueness in their fragrances. Its theme is perfect for spring, its lightness is perfect for summer. Sakura Cherry Blossom became my go-to perfume last month. I am enjoying it to bits and planning to wear it during Summer as well. Osmanthus Blossom is the white floral offering of this collection. Although I appreciate white floral scents, they seem to like my skin way too much and become a little more prominent than intended. This might change the balance of the creation. After I tried Osmanthus Blossom, I thought it was the case for this particular scent too. After letting it settle for an hour, although Osmanthus was very easy to pink up, all in all it turned out to be a gorgeous composition and the balance was preserved. Now I am waiting for the collection to launch at my local Jo Malone Counter (Douglas Koenig Strasse). I might have to get that one too, especially because it also combines beautifully with the rest of this collection. Final thoughts: Jo Malone Sakura Cherry Blossom and Plum Blossom are both lovely fragrances which are great for Spring and Summer due to their light characters. 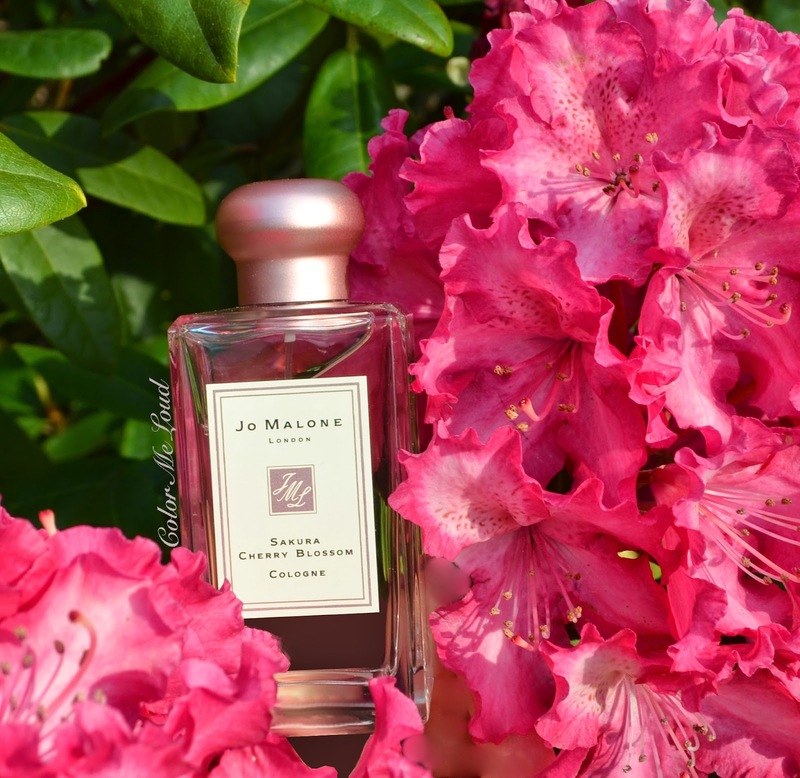 If you are in search for something more unique than the generic sugary fruit or tropical coconut summer scents and in for a soft woods and musk combined with unique floral heart, make sue to check out Jo Malone Cherry Blossom & Plum Blossom. Availability: Jo Malone Blue Skies & Blossom Collection had different launch dates from April to May worldwide. All three fragrances are now available online in Germany at Douglas. They are limited edition and offered in 100 ml flacons retailing for 100€ each. Have you sampled any of the fragrances from this collection? Do you like the smell of cherry blossom trees? Thanks for sharing a little of your trip with us.The pictures are lovely too. This collection sounds interesting. I have not tried Jo Malone fragrances, though I enjoy the candles. I don't have a counter near by and have heard mixed reviews on the longevity of the fragrances. On you these seem to do well though! Oh Sara, I love these photos! You should do outdoor photography more often! :D It's so nice that you found something special that reminds you of your trip to Japan. 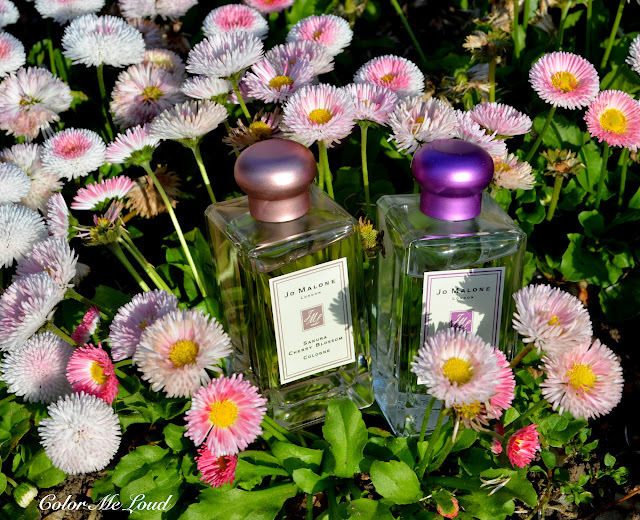 I've never been to Japan, nor have I tried any Jo Malone fragrances, and now I want to do both! Now I need to take a whiff of Plum Blossom! I have the other two, and they are both beautiful scents. Really wish Jo Malone had more than one counter here in Belgum! I haven't tried any Jo Malones but I have to say, these pictures are so beautiful! Did you take them out for a walk, or are these flowers from your garden? Jo Malone makes such beautiful unique fragrances, you should definitely check them out. Thanks to the comment about the photos. I took the flacons out for a walk in the park next to our house. I am still trying to make my mind about Osmanthus one. I am not big on white florals but that one is so pretty and light. Oh they have just one counter? Maybe there will be more soon. We have one counter in my city, which I am visiting so often they know me well by now lol. I believe you would love Cherry Blossom. It is the one with more woody basenotes. Let me know how you find it after you try it out. thanks for your lovely comment. If it wouldn't be raining all that much here, I would definitely go more often with some bottles to the park, lol. The people also look like as if I am crazy, taking photos of perfume bottles between flowers hahaha. But it is so much fun. Oh and yes you need both, Japan is now closer to you and I am sure you have a Jo Malone counter close by so why not? LOL at walking these fragrances! I loved reading this post very much, Sara... thanks for bringing us back to Ninna-ji with you and those sakura blossoms! I tested these in stores, they really are quite lovely, but I was too late they were already fully soldout. Yes! I have heard that Guerlain Cherry Allegoria is also very nice (and close to Sakura). Let me know your decision!